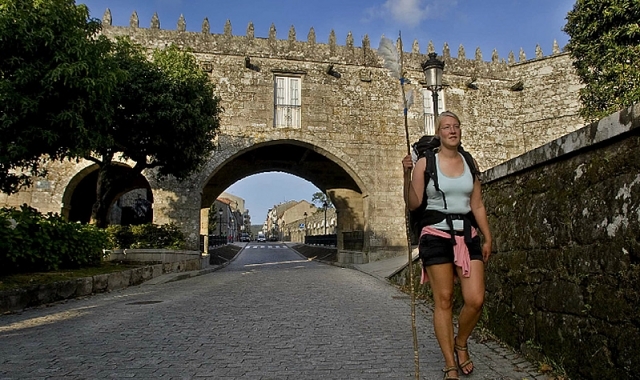 A pilgrim passes under the arch of Pazo de Cotón / Photograph by Paco Rodríguez Its strategic location, just over 20 kilometres from Santiago and, it being an obligatory stopping place for pilgrims on route to Finisterre/Muxía, has enabled Negreira to be converted into an attractive centre with an abundance of services for walkers. A pilgrim passes under the arch of Pazo de Cotón just over 20 kilometres from Santiago and, it being an obligatory stopping place for pilgrims on route to Finisterre/Muxía, has enabled Negreira to be converted into an attractive centre with an abundance of services for walkers. If you are traveling on the Camino de Santiago or are planning to do so soon, you should know that the distance separating Negreira from Santiago de Compostela is 21 kilometers.